Tucked away in an unassuming house on University Square is one of Belfast’s oldest and most unique cinemas. Celebrating its landmark 50th anniversary, don’t miss this special evening in the Queen’s Film Theatre with a screening of the 1956 film Together featuring a live performance from jazz musicians Raymond MacDonald and Christian Ferlaino. Unlike other cinemas in the city, the QFT comes equipped with a fully licensed bar allowing you to kick off the evening right with a glass of wine or a fine bottle of craft beer before going into the screening. Want something devilishly wicked to take your date to this Halloween season? Look no further than Freak Show in The MAC! A new original blast of irreverent theatre from North Coast based Big Telly Theatre Company. Inspired by the story of the real 17th Century Portrush Giantess, Mary Murphy.Roll up if you dare and marvel at the Brainless Brother and behold the talking corpse and the Pig‑Faced Woman. Your jaw may drop and you will definitely be entertained. With pre theatre options and potentially unique set menus from The MAC’s own NATIVE restaurant by Yellow Door to satisfy the appetite, this is set for a complete evening celebrating the weird, the wonderful and the completely absurd. Sometimes on nights out you just need to see a film or watch a show which tells a story about love, regret and loss, be it with a significant other or with a good group of friends. The world premiere of Dear Arabella by Belfast born playwright Marie Jones delivers just that. A new play by Jones is often an event in itself, so start it off with a pre theatre trip to Holohan’s, Molly’s Yard or the city’s hottest new bar The Jeggy Nettle before making your way up Stranmillis to the Lyric Theatre for this profound and poignant piece which might require some deep contemplating or conversation in the pub afterwards. Is there anything more romantic than an evening of poetry and music set around the greatest love poem in the Irish language? Pulitzer Prize winner Paul Muldoon and the iconic Celtic rock band Horslips present a brand new translation of The Lament for Art O’Leary. This special attraction is the perfect main event to any Friday night which begins with dinner in the intimate surroundings of Coppi or Buba followed fittingly by drinks in a pub named after one of Belfast’s greatest poets The John Hewitt Bar in the city’s now famous Cathedral Quarter. Eric Bibb, the fiery singer with true soul, gospel and folk roots, is an event not to be missed. An occasion which can be kicked off perfectly by a pint of Guinness or a glass of wine in the iconic Crown Bar opposite the venue followed by dinner in a slew of different City Centre restaurants from Mourne Seafood, to Howard Street, to Ginger Bistro, to even a special meal in the brand new Grand Central Hotel making the Festival experience a definitively memorable one. 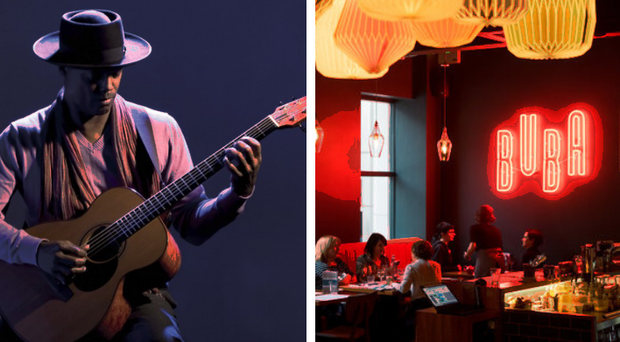 Win two tickets to see soul and blues legend Eric Bibb at the Grand Opera House plus a £50 voucher for Buba in St Anne’s Square.